Alyce has found a new way to play at the house. It's the bathtub. 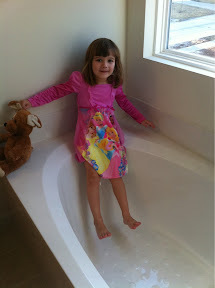 Alyce is using Mom and I's master bath tub as a slide. She started sliding down it yesterday and today I got to see her do it first hand. I'd say it isn't much of a slide but Alyce seems to enjoy herself while using it. Here's a video of her sliding.